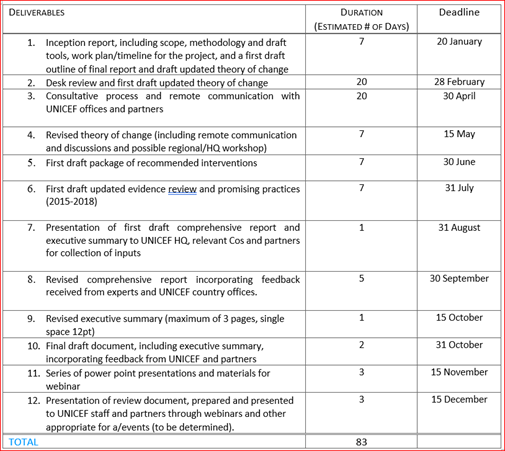 To conduct an update of UNICEF existing evidence review and theory of change to prevent and respond to child sexual abuse and exploitation, online and offline, and develop a package of programme recommendations for governments, UNICEF and other relevant development partners. Sexual violence is one of the most unsettling of children’s rights violations. As such, it is the subject of dedicated international legal instruments aimed at protecting children against its multiple forms. Acts of sexual violence, which often occur together and with other forms of violence, range from direct physical contact to unwanted exposure to sexual language and image. Even when not accompanied by physical force or restraint, the sexual victimization of children resulting from emotional and psychological manipulation, intimidation and verbal threats, deception or entrapment can be equally intrusive and traumatic. The protection of children from all forms of violence, exploitation and abuse in all settings, including the home, schools and community, is a priority for UNICEF and part of UNICEF’s Strategic Plan for 2018-2021. Cognizant of the prevalence of sexual violence against children across settings and the need to provide specific guidance on effective interventions, UNICEF published in 2015 an evidence review and compilation of promising practices to prevent and response to child sexual abuse and exploitation based on an analysis of programmes implemented until 2013. UNICEF publication Promising programmes to prevent and respond to child sexual abuse and exploitation proposed a specific theory of change and monitoring framework to address child sexual violence. Over the last five years and since the finalization of UNICEF’s publications regarding prevention and response to child sexual violence, historical milestones have been achieved leading to the definition of a global agenda and UNICEF’s specific theory of change, organizational strategic goals and recommended programmes to comprehensively address violence against children (VAC), including sexual violence, abuse and exploitation. In 2013, UNICEF launched its global #ENDviolence campaign followed by the publication of UNICEF’s Ending Violence Against Children: Six Strategies for Action and the first global analysis of comparable country data on violence on children, Hidden in Plain Sight. On the global level, the SDGs were developed setting targets for the international community to end all forms of violence against women and children. In 2015, UNICEF completed a global evaluation of VAC programming, which showed that UNICEF would not be able to contribute to the achievements of the SDGs without significantly strengthening the VAC Programme. These recommendations lead directly to the development of UNICEF’s VAC Theory of Change. Ultimately, UNICEF’s Strategic Plan 2018-2021 (SP) cemented violence against children as an organizational priority, as one of the five main goals. On the global level, in recognition of VAC as a public health issue, the World Health Organization worked in close collaboration with UNICEF, other UN agencies and key partners, to develop a technical package - INSPIRE: Seven strategies to end violence against children to contribute to strengthening the effectiveness of programmes and approaches to end VAC. INSPIRE was launched alongside the Global Partnership to End Violence against Children. In order to support implementation of these strategies, the INSPIRE Handbook and the INSPIRE Indicator Guidance and Results Framework were launched in 2018. UNICEF is currently further developing its internal Programme Guidance to End VAC, highlighting UNICEF’s specific role in contributing to the Global Agenda on VAC. Another important global development since 2015 has been the increasing focus placed on the specific challenges to address sexual abuse and exploitation when facilitated by ITC. UNICEF joined the WePROTECT Global Alliance to End Online Child Sexual Exploitation and supported the development of a Model National response (MNR). In support of the implementation of the MNR, UNICEF set in motion a global programme to tackle online child sexual abuse and exploitation in 30 countries across six regions, with the support of the UK Government under the WePROTECT initiative and subsequently of the Global Partnership to End Violence against children. A key part of this effort is to document lessons learned from current programmes, identifying emerging and promising practices and gaps in comprehensively addressing online child abuse and exploitation across the capabilities of the Model National Response. Considering the significant increase in programmatic investment to address VAC, including sexual violence, and the newly defined organizational and global strategic approach, theory of change and recommended package of interventions, UNICEF recognizes the need to update the previous publications, evidence review and promising practices, addressing child sexual abuse and exploitation with new emerging practices ensuring full alignment of UNICEF’s theory of change to address sexual violence with global and organizational overall End VAC approaches. The UNICEF Child Protection Section is therefore conduct an update of UNICEF existing evidence review and theory of change to prevent and respond to child sexual abuse and exploitation, online and offline, and develop a package of programme recommendations for governments, UNICEF and other relevant development partners. To conduct an update of UNICEF existing evidence, review and theory of change to prevent and respond to child sexual abuse and exploitation, online and offline, and develop a package of programme recommendations for governments, UNICEF and other relevant development partners. Develop a comprehensive package of programme interventions and recommendations across the prevention, identification and referral and response spectrum building upon 1) the checklists proposed in the promising programmes document, 2) programmes reviewed (whether rated as low, pioneering, emerging or promising) and 3) recommended interventions by UNICEF, government and partners. Considering the absence of evaluations of many programmes and the recent nature of some interventions (especially online protection), recommendations will need to include interventions that may have not been evaluated when necessary to comprehensively implement UNICEF VAC programme guidance (ei. adoption of specific laws). At least 2 rounds of presentations of draft report to UNICEF and partners and gathering of feedback. Revise report based on feedback. Presentation of final report through a webinar to UNICEF global staff and partners. DUTY STATION: Home based and remote work. The consultant is expected to travel to NYC at least once during the assignment. Master degree in social sciences or related fields. A senior consultant with a minimum of ten to fifteen years relevant professional work experience at national and international levels in development field, with a focus on women and children’s rights and violence prevention and response, in particular sexual violence and other forms of gender-based violence. Proven research skills and demonstrated expertise in analysis and development of technical papers and reports as well as programmatic guidance related to violence against women and children, in particular sexual violence, gender and child protection. Published work an asset. Operational experience at country/regional level in the implementation of programming related to violence against women and children, sexual violence, gender, and child protection. Good understanding of child protection systems and changing social norms, attitudes and practices harmful to children and women. Knowledge and experience in working in emergencies, especially on the issue of GBV, especially sexual violence. Knowledge and experience of UNICEF policies and programmes of cooperation, including on child protection, a plus. Prior experience working with the UN/UNICEF an asset. Capacity to work independently yet with ability to share information, receive feedback and engage in dialogue with partners. Excellent analytical, communication, writing and editorial skills in English language. Working knowledge in another UN language an asset.